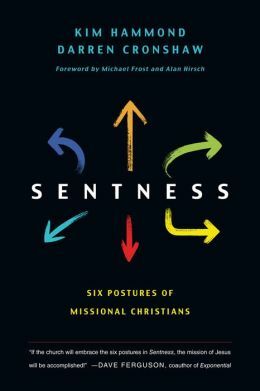 A review of Sentness: Six Postures of Missional Christians, by Hammond & Cronshaw. Published by IVP. There has been quite a shift in the way many churches operate over the last 15 years. Probably the easiest way to think of it is a move from trying to attract the community in, to sending faithful believers out. With the scandals that have lowered the attractiveness of the church to the general public, such a move is a wise strategic move. However, in this book, Kim Hammond and Darren Cronshaw advocate that missional is more biblically obedient and spiritually nourishing than mere strategic necessity. “True missional communities read the Gospels not as bedtime tales but as dangerous stories to be lived out in communities that share life and common mission,” they explain. In this excellent (if somewhat idiosyncratically-named) book, they outline what they describe as “postures” for both churches and their members for living out a “sent” faith. What is extremely helpful is that they also include inspirational stories of individual and church initiatives to illustrate their points. This means that the book is both wise, and affirming. Further, since Hammond and Cronshaw are both Australians, these stories are written in language and contexts we can easily relate to. Standing in the gap to empower others to achieve. Church people think about how to get people into the church; kingdom people think about how to get the church into the world. Church people worry that the world might change the church; kingdom people work to see the church change the world. What keeps you going when things are tough? Do you reckon there is any overall meaning and purpose to life? What were your earliest impressions of who God might be? Has there been a time in your life when you felt God was closest? What are some of your biggest issues with Christians today? What do you think about prayer and whether it does anything? In another chapter there are diagnostic questions that help us look for ways of reconnecting with local communities or investing in change in our workplaces: are there celebrations that we can join in? Are there changes that we can be part of? Or are there conflicts in which we can be peacemakers? Another element that I appreciated about this book is the honesty of the authors. They talk about the messiness of working out where God is sending us, and why things don’t always work out. Kim Hammond shared about his excitement at feeling called to work among churches in America, only to arrive and have their son diagnosed with leukaemia. The dream turned into a battle, and when Kim was questioning God, his eldest son Lachlan pointed out that God knew his brother was going to get cancer but still sent them, so obviously the family was meant to stay in America. [T]he beauty of sentness is you don’t have to plan a whole lot of modern infrastructure before you get started, or even after you get started. You don’t have to worry about the chaos of change or feel like you have to manage and control it. You don’t have to stress about organizing everyone, as if it all depends on you … You can embrace the shift to a new paradigm and flow with the rhythms of life. It is simply about realising that I am sent by God to continue the redeeming work of Jesus in the power of the Spirit, wherever I am, to whomever he brings across my path. Kara Martin is the Associate Dean of the Marketplace Institute, Ridley Melbourne, has been a lecturer with Wesley Institute and is an avid reader and book group attendee. Kara does book reviews for Open House and Eternity Magazine.